Quick summary: Students are asked to consider how waste patterns have changes over time and complete a colouring-in worksheet that shows the changes in the ways that people have used materials and disposed of their waste over the past 400 years. They will also be asked to predict what life might be like in the year 2050 and what waste disposal methods will be available then. Students learn that Australian Aboriginals lived very lightly on the land, using natural materials for their tools, clothing, shelters and weapons. Students discover that since European settlement, people in Australia have used increasing amounts of resources to support their lifestyle and have been producing increasing quantities of solid waste. Students will understand that the way that Australians dispose of their waste has changed dramatically over the past 60 or so years. Syllabus Outcomes: ST1-11LW, ST1-9ES, ST1-12MW, HT1-1, HT1-2, HT1-3, HT1-4. Level of teacher scaffolding: Medium – gather materials, copy worksheets for students. Resources required: scissors, pencils, pens, glue, copy of Doorways to waste: Student Worksheet for each student. Homework and extension opportunities: This activity includes opportunities for extension and homework. Keywords: Waste, history, future, Aboriginal Australians. Overarching learning goal: Students are given a worksheet showing three eras from the past and one from the future showing the changes in the ways that people have used materials and disposed of their waste over the past 400 years. They are asked to colour in the drawings and complete the drawing for the future scene and predict the types of waste disposal that will be available in the future. 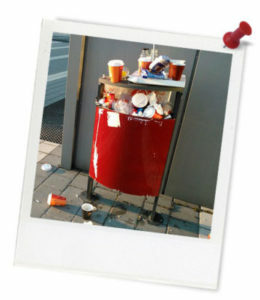 Where has waste been and where is it going?